READING | Bond, Gunter, Hector, McShane (c), Quinn (Sa 76), Norwood, Williams, McCleary (Taylor 62), Blackman, Robson-Kanu, Vydra (John 62). SUBS | Al-Habsi, Taylor, Cooper, John, Piazon, Sa, Liburd. WOLVES | Ikeme; Iorfa, Batth (c), Ebanks-Landell, Doherty; McDonald, Coady, Henry (Byrne 74), Edwards, Graham; Afobe (Holt 90). SUBS | McCarey, Golbourne, Byrne, Wallace, Le Fondre, Holt, Sigurdarson. Thanks for your company everyone - Happy New Year! A win's a win though! Cheers guys, see you down on the sunny South coast! cant go like this,theres far better clubs then reading to meet in the future ! Hurts to say it but we were lucky to take 3 points to-day , I suspect a mixture of Reading's poor attacking , and luck played equal parts in the result ! ! ! good blog ,carly, otto see you Monday night. 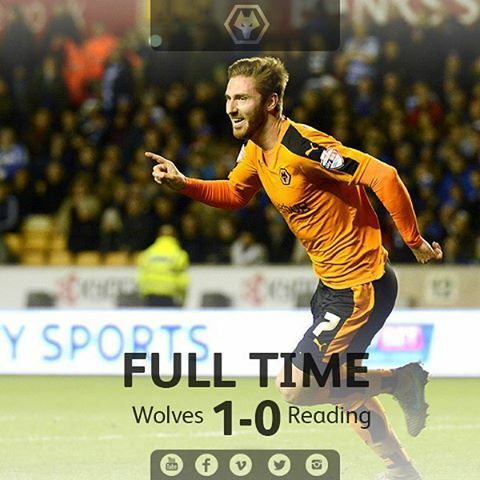 Wolves, once again failed to impress, with many players showing that they have reached their level of incompetence. It is a disorganized group showing little cohesion. If they continue in this mode they will surely find themselves battling relegation, and deservedly so. Lets hope management address this very soon. If we were Reading, all you nay-sayers would be trashing us for having all this possession and not scoring. Our boys are pure Old Gold. Let's keep the positive vibes heading in their direction!